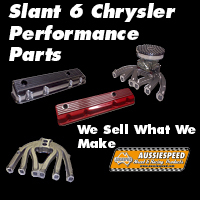 Small Engine Performance Australia offer a range of performance centrifugal clutches to suit single cylinder 4 stroke engines for go karts, mini bikes, racing barstool, off road buggies, fun karts, junior dragsters, mini hot rods, quarter midgets and commercial and industrial machines. 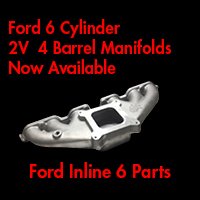 The centrifugal clutches offered are available for 3/4 and 1 inch crankshafts. 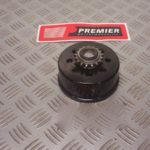 Small Engine Performance Australia not only sell complete clutches we also stock clutch drive sprockets, clutch springs, clutch shoes, clutch drums, clutch hubs and many other centrifugal clutch spare parts required to tune & rebuild your Noram, Inferno, Premier, Maxtorque and Hillard centrifugal clutch. HOW TO & THE IMPORTANCE OF THE RUN IN ON A NEW CLUTCH. The clutch on any racing engine is an area often over looked. 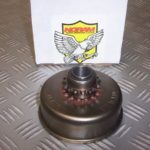 Noram clutches offer various clutch springs, clutch drivers or clutch drums or clutch bells as they are also called are available with a different amount of teeth, the number of teeth has an effect of the final drive ratio. 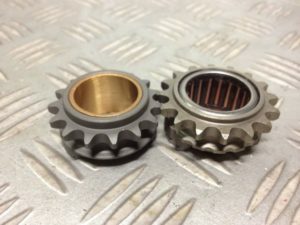 Noram clutches to suit 4 stroke engines have more teeth compared to a 2 stroke Yamaha engine as the crankshaft pto is normally a larger diameter then you add a bush & bearing the clutch sprocket has to fit over all this so the tooth count normally starts around 15 to 16 tooth with a 219P chain. Important Clutch Break in & Maintenance. When installing any new clutch regardless of brand most centrifugal clutch manufacturers have a recommended run in or bedding in procedure. With the new clutch fitted give the clutch around 10 minutes of engaging & disengaging with some slow take offs to get a little heat into the clutch drum and shoes but don’t get it to hot if there is a large amount of slippage and the clutch starts smoking it could possibly be that your gearing is to tall, engagement rpm lock up is to low. vary your driving some light acceleration, hard acceleration, some hard run from engagement speed up into to the higher rpm. Try to always squeeze the power on be smooth on the throttle when your clutch engages the clutch shoes, springs and drum try to move the clutch further up the key way & ride up the crank.For this reason it is very, very important to use a radius washer on the crankshaft to give the clutch a flat surface to run up on this is the same for either inboard or outboard mounting. 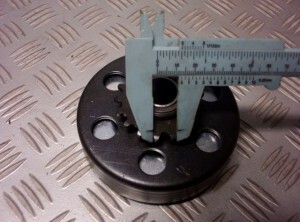 A crankshaft has a radius on the machined end of the crank & it is important that the radius washer matches the radius of the crankshaft and gives the clutch a square shoulder to run against.. We never recommend you rev an engine with a centrifugal clutch & the chain connected without the tyres touching the ground. If you are doing tuning or need to rev your engine always remove the chain. A free revving engine with a centrifugal clutch and no load on the engine is a recipe for disaster. The easiest way to explain this is as the clutch is engaged it is turning the tyres has the weight of the kart & the driver so the weight helps to engage the clutch and takes out some of the shock as the clutch engages. when an engine is free revved there is no load the clutch bites & locks up hard. there is no resistance and all the shock travels through the crankshaft. 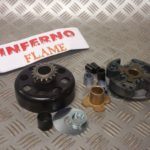 Undo the bolt pull the clutch of the crank dismantle the drum & inspect the clutch drum & shoes, wipe the drum with a clean cloth sprayed with BRAKE CLEAN, do not substitute BRAKE CLEAN for any other cleaning or degreasing liquid or fluid this method of cleaning is not recommended for the Inferno range. Spray the shoes and springs to clean the inside of the clutch inspect that the bearing is still greased and dirt has not gotten in and mixed with the grease. 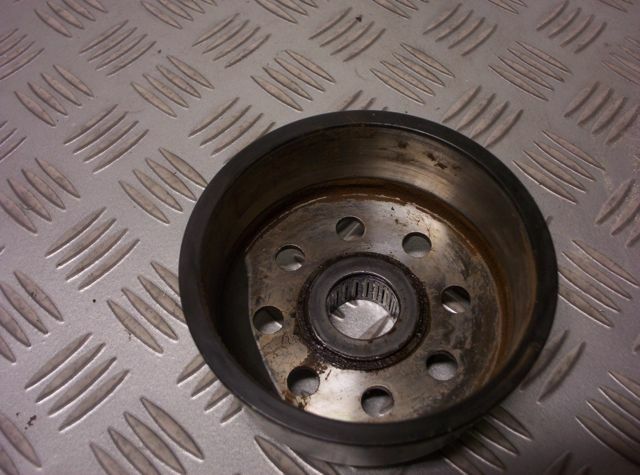 Never over grease the bearing any excess can be flung onto the shoes and can cause the clutch to slip. When you clean the drum and shoe light sanding of the drum is acceptable. always use a high temperature disc brake bearing grease. scuff burn marks can be seen on these Premier stinger clutch shoes. Note the mud that is on the shoes, it will stop engagement on that part of the shoes & will also stop the shoes from making contact with the drum. 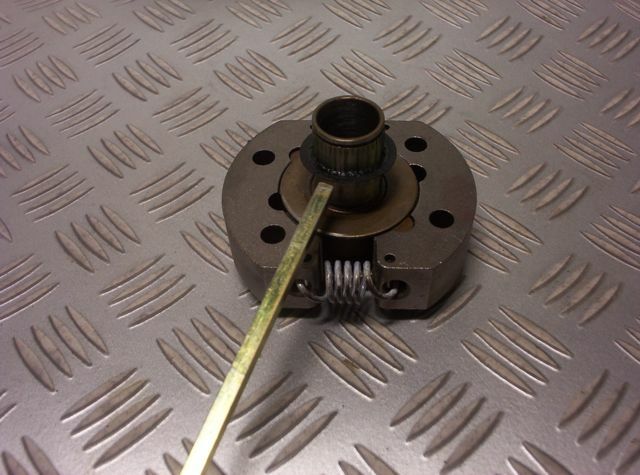 The Noram GE clutch springs can be interchange to achieve higher or lower rpm engagement. 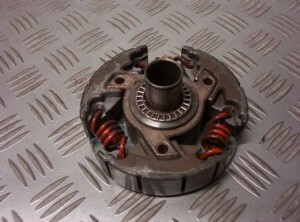 once the clutch bell is removed the springs can be removed & replaced. 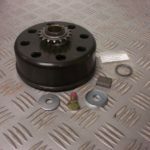 We have customers upgrading from the Maxtorque go kart clutch that ran a 35 pitch chain & rear sprocket. Always remember that most standard 4 stroke engines will load up 2 much with higher gearing. Always check the number of teeth on a 35 pitch driver from the Maxitorque clutch & divide it by the number of teeth on the rear sprocket. With a 35 pitch front driver with 12 teeth on the clutch hub & 72 teeth on the rear runs a ratio of 6.00 to 1. When going to a 219 pitch clutch the teeth are closer together, This means the number of teeth to go around a clutch hub of a 3/4 bore clutch will be more than a 35 pitch clutch. The equivalent gear ratio on a 219 pitch 15 tooth front driver is 90 teeth on the rear = 6.00 to 1. Clutch Chatter, Chain Chatter, Noisy Clutches. 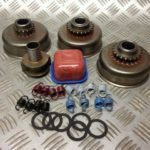 Nothing is more annoying or some time frightening than clutch and chain chatter, there are many things that can cause this problem and it is normally something that happens before the clutch is fully engaged, we hope you can learn a few things from our experience that can be the cause. Too lower engagement speed of the clutch springs, clutch loads up and to turn the wheels of the kart to get it moving the clutch will slip and grab when the shoes move out to lock the drum at the engagement rpm, some people will take there foot of the throttle and the clutch disengages and reengages and so on. 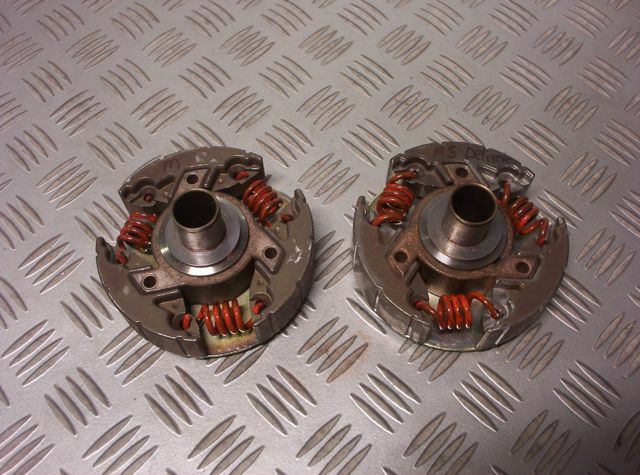 The heat generated by the clutch while it is slipping after a period of time can affect the tension on the springs. If this is something you are finding change the engagement springs to a higher setting so the engine is higher in the RPM & making more torque,when taking of all ways start your go kart with the wheels straight ahead so load is minimised. Too tall of gearing. The clutch loads up and to turn the wheels of the kart to get it moving the clutch will slip and grab, slip and grab once the clutch is fully engaged the noise will go away. The answer is normally to ad a few extra teeth to the rear sprocket will lessen the load. You may also find that the kart may have better acceleration. When adding extra teeth always be aware that the engine will need to to more RPM to do the same speed with a sprocket with less teeth. In most cases if you can accelerate quicker out of a turn or in a slower part of the track your times can be quicker. Keeping the bearing greased, replacing the thrust washer on the clutch hub, stopping the build up of grease & dirt, glazing the clutch drum and shoes will also offer better clutch life. 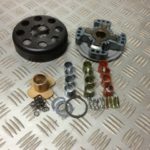 We have found that a prepared clutch with a coat of CRC DE SQUEEK on the drum & clutch shoes can remove some of the pre engagement problems on some brands of centrifugal go kart clutches. 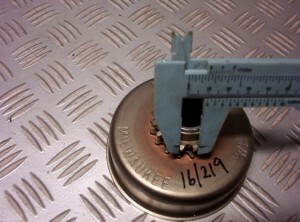 Due to the different materials used and different treatments used on go kart shoes and drums we recommend if you do use a product like DE Squeek you do not use it on a new clutch. 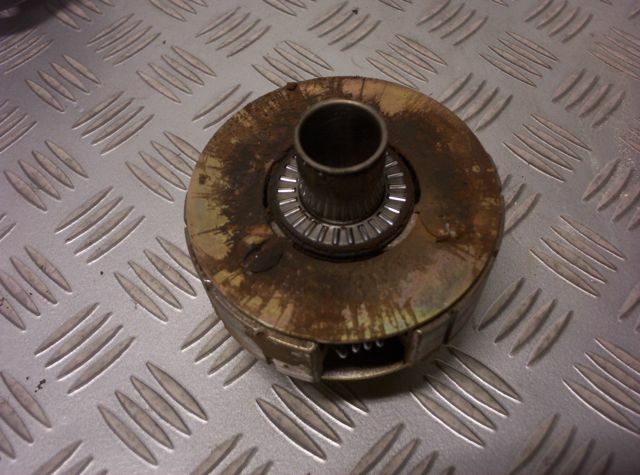 It may help but if used on a clutch that is not compatible it may cause the clutch to be ruined. 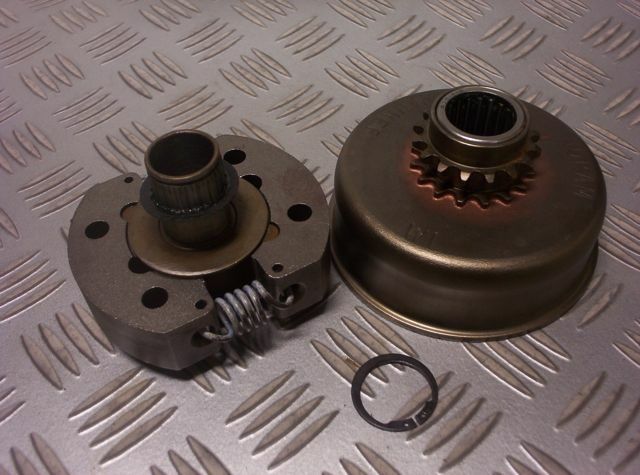 The titan clutch that is supplied with a world formula engine is a hard biting racing clutch. The lock up & grab from the Titan can handle the high output of the World Formula engine. 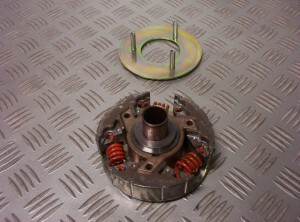 When mounting the clutch out board we have found that reversing the centre hub can lessen chatter noise that can come from the clutch as it engages.If you take note of the centre hub the copper colored section with the 3 twisted arms that locate into the clutch shoes you will see the position that they are in when they are delivered. With the clutch disassembled the center hub has been reversed,The arms are facing in the opposite direction.when the clutch is reassembled all other components are replaced back into there original place. 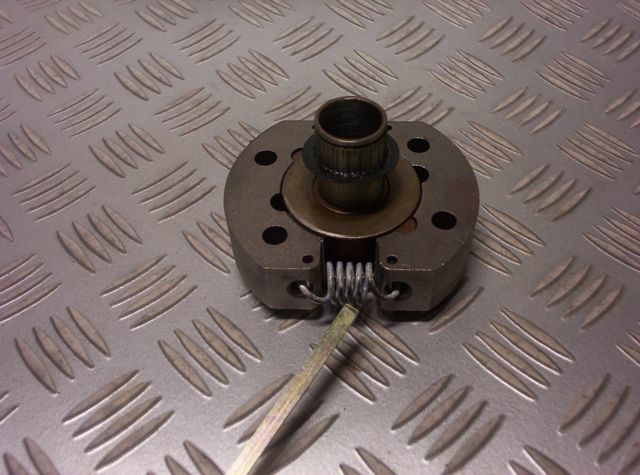 Without disassembling the clutch & removing the front & rear cover you will not no how the hub has been assembled. The Premier clutch on the right is as delivered from Briggs & Stratton with a World Formula engine package from our understand the clutch supplied is set for inboard drive, The sprocket or driver next to the side cover. 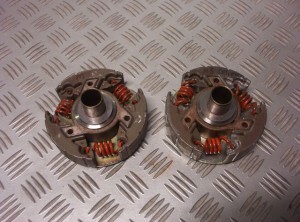 The clutch on the left has had the center hub reversed. This is how we set clutches up for outboard set ups. 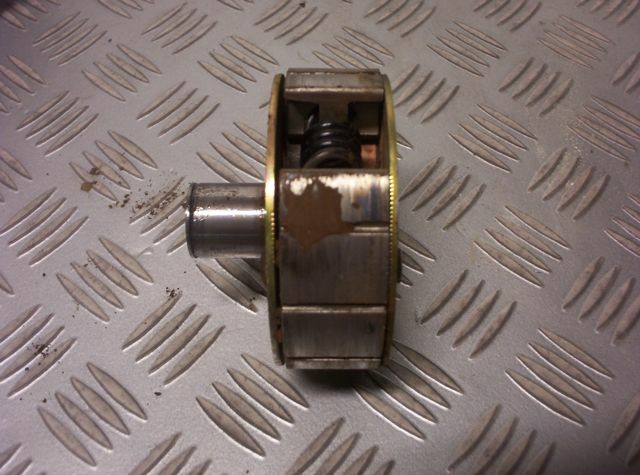 With either clutch fit ups ALWAYS USE A RADIUS WASHER between the clutch & the crankshaft. Clutch Drivers or Sprockets,The sprocket on the left uses a bush this is the only way you can get a 15 tooth 219 Pitch sprocket to fit over a 3/4 shaft PTO/crankshaft. The sprocket on the right uses a bearing,Bearings are available in 219 pitch sprockets from 16 tooth upwards. The chain drive on a go kart is the thing that gets the power from the engine through the clutch & clutch sprocket that turns the sprocket on the rear axle.The #35 or 35 pitch chain is used in most 4 stroke go karts in the USA. 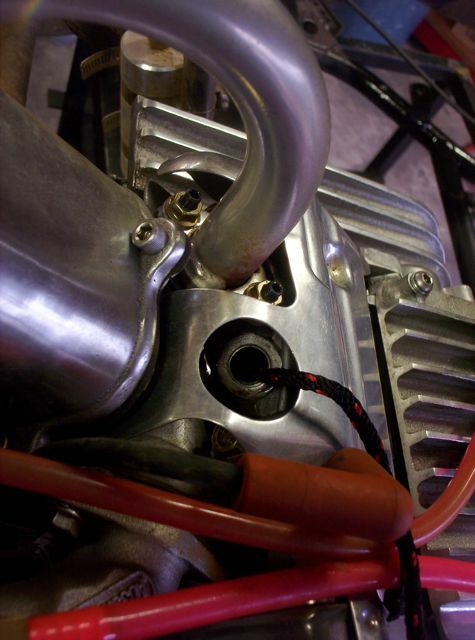 The 219 pitch or #219 started its use with 2 strokes.the 219 pitch chains started in Europe & japan where it can be referred to as 8mm chain.The 219 pitch chain allows for an extra 9 more teeth on the rear axle that can alter the final drive of the gokart without increasing the diameter of the rear sprocket.an 81 tooth 35 pitch rear sprocket is approx 250 & a 90 tooth 219 pitch rear sprocket is approx 229mm the advantage of a 219 pitch chain drive is extra teeth can be added to the rear axle to achieve a lower ratio without the rear sprocket hitting the ground. 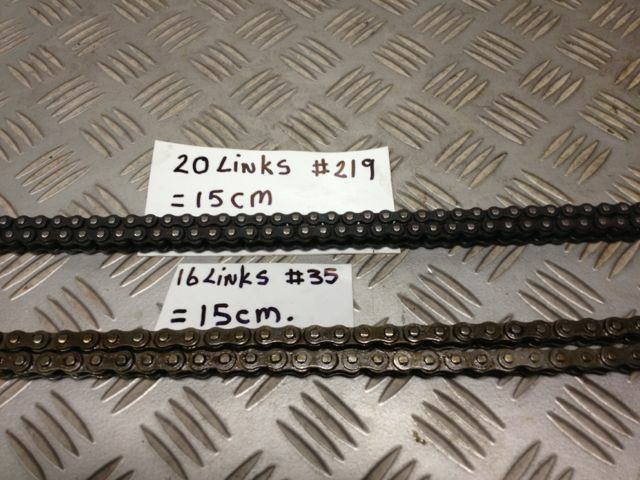 1 metre length of 219 pitch chain is over 10% lighter than a 1 metre length of 35 pitch chain.With the pins of the link being closer you can expect a 219 pitch chain to last longer & be kinder to both front & rear sprockets.